From down the well: I'm in my studio! I wanted to wait until my studio was all done and perfect before I showed more photos. But I could not wait that long to get in and start working so I thought I'd do the slow blow by blow account for you over the coming weeks. As you will see the studio already has interesting features. Some permanent, some definately not. The wooden desk came from my Chambers when I was a barrister and is now my sewing desk. The glass desk is my writing and computing area and came from John Lewis. The black drawers are supposed to hold all my fabric and threads. Of course they don't. But there is other storage space so that's OK. 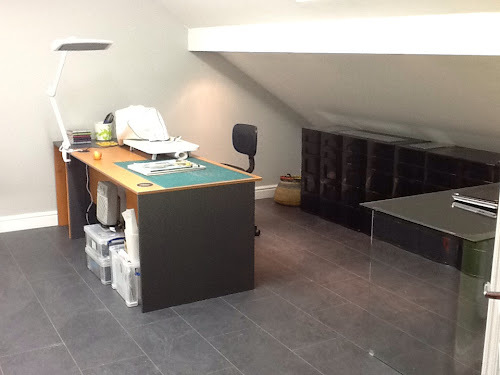 The boxes under the desk will be tidied away too and either an inspiration board or a set of narrow shelves will go at the side of the desk in the eaves. I have not quite decided yet. In front of the desk you see my innovative design towel. This low cost work area is at optimal height for maximum backache and is also of optimal uselessness as a cutting surface. It will be replaced by a kitchen island type worksurface made from kitchen cabinets on castors on Monday. Or on whatever day the builder thinks counts as Monday. I am not saying he lies, but let's say he does not have perfect timetabling skills. 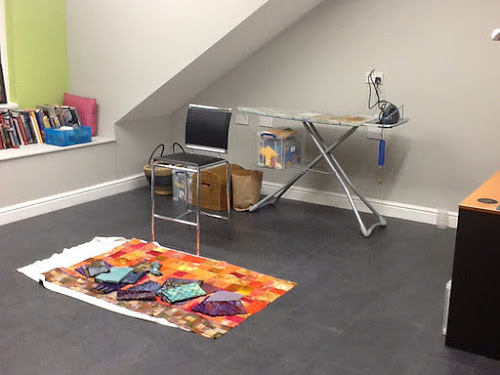 That island will have an overhang,hence the bar stool, so I can sit and do design or fusing work there. The artistically embellished ( with rips and burns) ironing board will be replaced by an identical ( save for being slightly narrower) island. This means i can push the two togther if I ever need a large surface still. 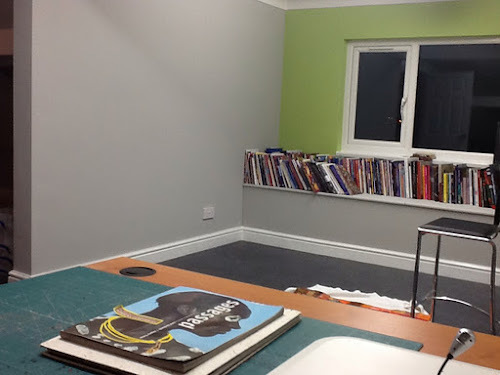 My main design wall will go between the pressing surface and the desk and extend over the side of the desk. 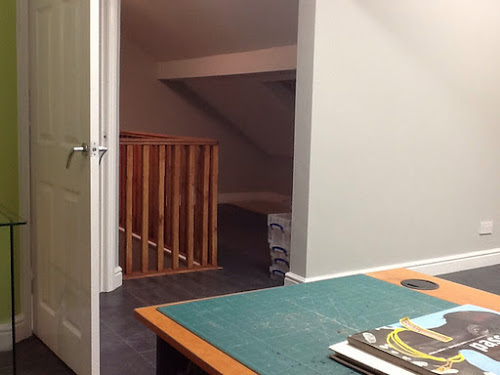 Being a loft conversion, wall space is not in good supply so the design area is maybe not as big as is ideal but it is big enough. The one straight full height wall there is will house the shelves that match the cherry desk. The books currently on the window seat will fill about half the shelf space so there is plenty of room left and on top I plan African baskets that my friend Magie is going to go and pick for me on her next trip to Ghana. My wadding roll and scraps boxes will go in the window seat, on which there will be cushions, of course. To the left of the desks area are the stairs and the reading nook area, which will have low bookcasing all around and an arm chair and foot stool.I am debating between a deep pink and a green colorway in a stripe fabric. I am going to go back to the shop on Friday to choose. I may put a secondary design wall at the foot of the stairs. Also to the left of the desk you can see the door to the bathroom. 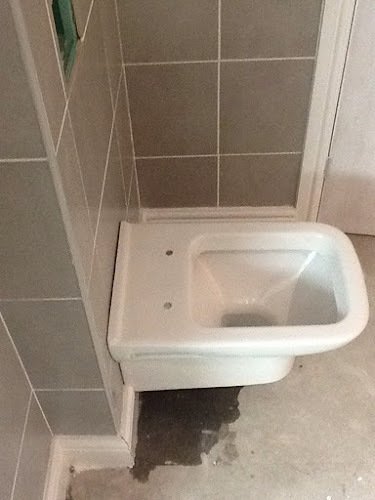 Now, I have to tell you about my design bath. First of all, I can see the design wall from it, perfect for seeking inspiration. Then, it is an air bath. No nasty chrome outlets. Just tiny pinprick holes. AND... Lets say I run the bath and then decide I need just five minutes more quilting time. I can press a button and my bubbles will come on in exactly five minutes time. And if I keep doing that so that my quilt gets bigger but the water goes cold I can press a button and it will heat up the water that is already in the bath without me having to add more. 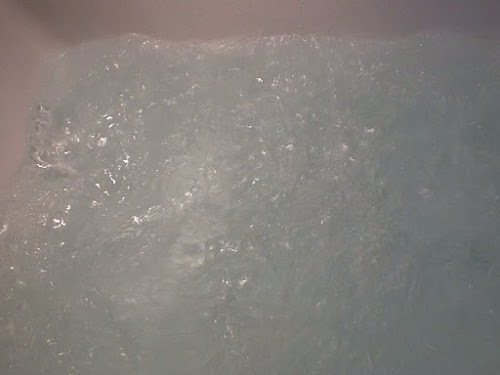 I love this bath. I bought it with the last cheque I got from the freelance lecturing work I used to do and everytime I use it I have a moment when I remember the fun parts of working in London on expenses, the hassle of travel, the joy of making large groups of people laugh and the misery of being ill alone in a hotel room. 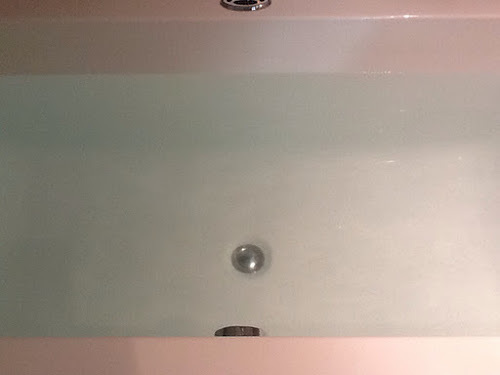 This bath makes me both proud of what I achieved in my day job to be able to buy it and inspired to achieve (albeit with different criteria) with my art. On the other side of the bathroom is the toilet. The seat remains in the hall down stairs and you will see that we have a leak. Sigh. The builder came out tonight to isolate the water and is coming first thing tomorrow to sort it out. Frankly, I am amazing myself with my patience these days. Thanks for the tour - all is looking good. And as for the bath, what more inspiration could you need? Oh goodness, it all looks wonderful. I can still picture where you used to do your quilt making and this is top notch. Love the look of the sink. It looks fantastic. So happy that you are getting settled in and will be making fabulous work. We missed you soooo much in Houston! Oh! Oh! It looks wonderful! I can't wait to see it as you continue to add stuff and get the bookshelves in and everything. Will there be a chair for Dennis to sit and keep you company while you sew from time to time? It is looking wonderful and I especially like the bath with view of the design wall. I bet Nancy Crow doesn't have that. What a fabulous new space! Wow. Everything looks great. Isn't it lovely to have a dedicated space? Worth the wait! It looks wonderful. 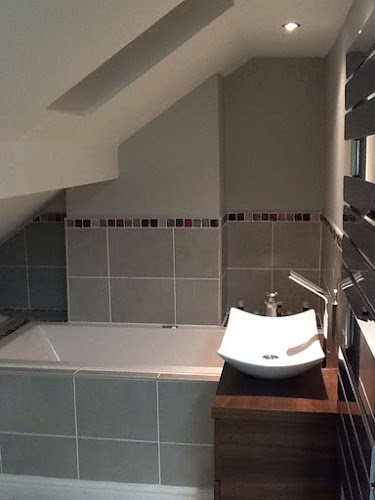 I want a design bath too - a great idea! Just catching up on your posts whilst daughter is out with Brownies, but I can't see any photos with this post. Is that the point? Am I supposed to imagine it all? Right then. I'm moving in with you...ok?